Legal advice provided by deputy Senate clerk Richard Pye confirms the Senate has ”undoubted power” to force Infrastructure Australia to hand over the documents, which the state government insisted must remain secret to protect delicate commercial negotiations. The advice, in a letter to Greens leader Christine Milne, says the Senate has power under section 49 of the constitution to demand existing documents held by a Commonwealth agency. The Greens, who will continue to hold the balance of power in the Senate until at least the middle of next year when the term of the Senate expires, are battling to retain the seat of Melbourne where the east-west link is a key issue in Saturday’s election. 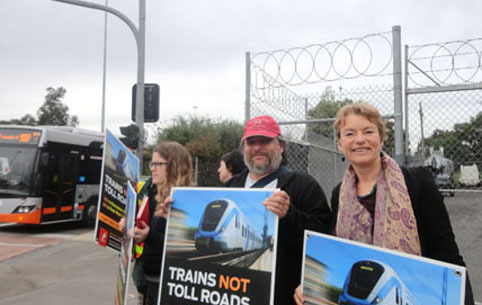 Provided Labor supports the move, a vote forcing Infrastructure Australia to hand over the full business case for the link would create a headache for the state government, which has refused to release details of traffic forecasts, or the likely taxpayer contribution to the $6 to $8 billion project. Greens deputy leader Adam Bandt vowed to ”use our numbers in the Parliament” to make the business case public, urging Labor to vote with the Greens. The Greens previously used the ”return to orders” powers to force the federal government to reveal details of mining tax revenue. Infrastructure Minister Anthony Albanese refused to comment on whether Labor would back the move. The state government has released what it called a short-form business case, asserting the road will generate $1.40 of benefits for every $1 investment. The assumptions behind the claim have not be released, although it is believed the analysis does not comply with Infrastructure Australia’s usual system.